I was in Seville for a day and a half and in the previous entry I only posted photos from the first day. Of course Seville is too beautiful to be condensed into only one post, so here is day 2 in a nutshell. On the second day in Seville, I visited the Alcázar of Seville, the major attraction of the city aside from the cathedral and the Plaza de España. The Alcázar is a royal Moorish palace with nice architecture and some beautiful gardens. It is situated right in the old town beside the cathedral, but it took me a while to find the main entrance because I kept circling around the outer walls of the palace, according to Google Maps. Then when I found it, I felt so stupid as it was RIGHT THERE, with a long queue (~30 minutes) to get in! Afterwards I went to the Metropol Parasol, which is a massive wooden structure that resembles…waves? Trees? I dunno. I quite liked this contemporary style though, and was rather surprised to find it so close to the old town. I didn’t go to the top but I think I should have – will keep that in mind for future visits! Obviously I had to have tapas in Spain, and this is only a small selection of what I tried over the two days. I have to especially mention the “Secreto Ibérico”, or the “Iberian Secret”, which is the hunk of meat on the potato slices. I actually didn’t have high hopes for this pork dish because its presentation paled in comparison to the others – merely meat on some potatoes. Even though I ordered a half portion, it was still so huge that I thought I wouldn’t finish it. WRONG. As soon as I took a first bite, I was awed at how juicy and flavourful the meat was…oh my it was delicious! You certainly don’t judge pork by first impression, and this got me really wondering…what IS the secret of Iberian pork?!?! Oh, and some ice cream was also very appreciated in the scorching heat! Where is the Barber of Seville? …well, except for maybe Venice. Actually one of my first thoughts upon arriving in the old town of Seville was, “It’s kind of like Venice…but maybe nicer (and without the water)!” Ha, I hope the Spanish aren’t offended that I’m comparing Seville to Venice! Yes, summer in southern Spain means having to put up with extreme heat, sometimes going up to 40°C, but that didn’t matter! As my Spanish colleague has told me, people in Seville know how to keep themselves cool, which means that there is plenty of shade everywhere and water mist being sprayed from restaurants and shops as you pass by. As a result, the heat was actually not too unbearable! I was unfortunately only in Seville for a day and a half but I would go back in a heartbeat. After all I still have to find the famous Barber of Seville! 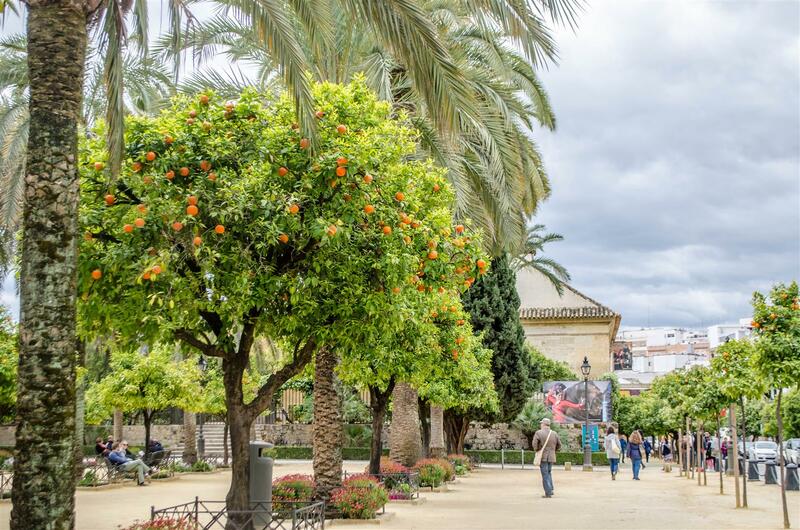 Stop to smell the oranges…in Córdoba! During the Easter holidays, I travelled to Portugal and Spain with some buddies from Canada. 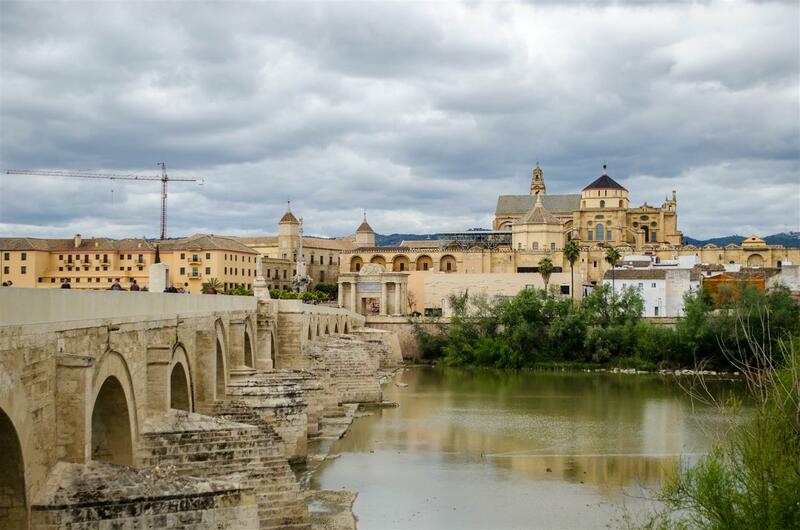 When I asked my Spanish colleague for ideas of day trips from Madrid, I learned about the Andalusian town of Córdoba, having considered Segovia and Valencia previously. My colleague, who is actually from Valencia, instead brought up Córdoba and strongly recommended it, mainly telling me about the Mezquita, or the mosque-cathedral of Córdoba. Well, you don’t refuse a Spanish when he provides a suggestion on where to go in Spain, so it was decided that Córdoba would be our day trip – although neither I nor my two companions knew much about Córdoba at all. But that’s OK – wandering is half the fun! 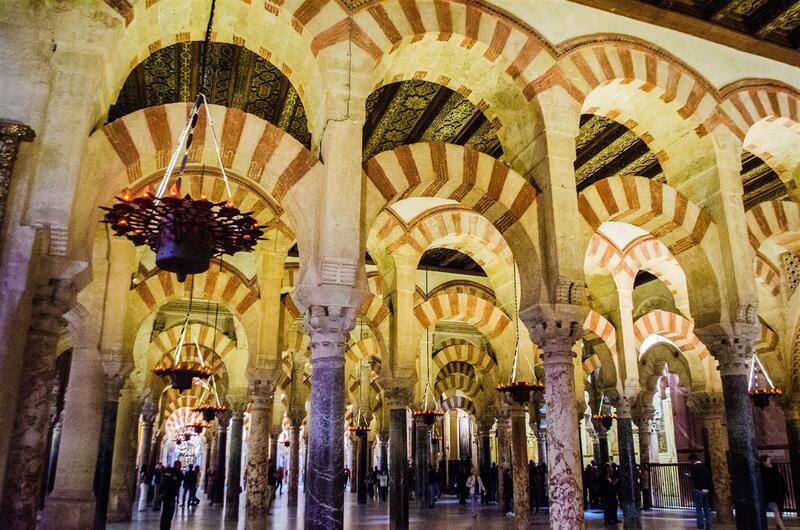 Even having done some research on the attractions a little bit beforehand, it was clear that the Mezquita is what brings most people to Córdoba. The Mezquita – or mosque – has a rich history behind its gates. Known as the mosque-cathedral of Córdoba, it was originally a cathedral but was converted into a mosque when Spain was under Islamic rule. After the Reconquista, when Spain fell under Christian rule, the Mezquita was converted back into a cathedral and remains so till this day. The ubiquitous columns and arches that line the interior of the Mezquita were its highlighted features. Made of jasper and marble, more than 850 of these pillars stand in the Mezquita, and walking through the arches makes it feel like you’re traversing a city itself. With that said, the interior of the Mezquita was huge! It certainly fooled us from the outside, and I lost my companions more than once. You could imagine how hard it was to find them under dim light in a crowded place! Back in town, my friends and I decided to explore Córdoba a bit. We met an American lady at a tapas market in Madrid who visited Córdoba before arriving in Madrid. She described Córdoba as “quaint”, and while I think that the word “quaint” is often overused to describe small, charming towns, you can’t deny that it is an appropriate word. And it is often these places that are quaint and picturesque towns that attract me more than the big cities. My friends and I were confused when we saw these figurines. 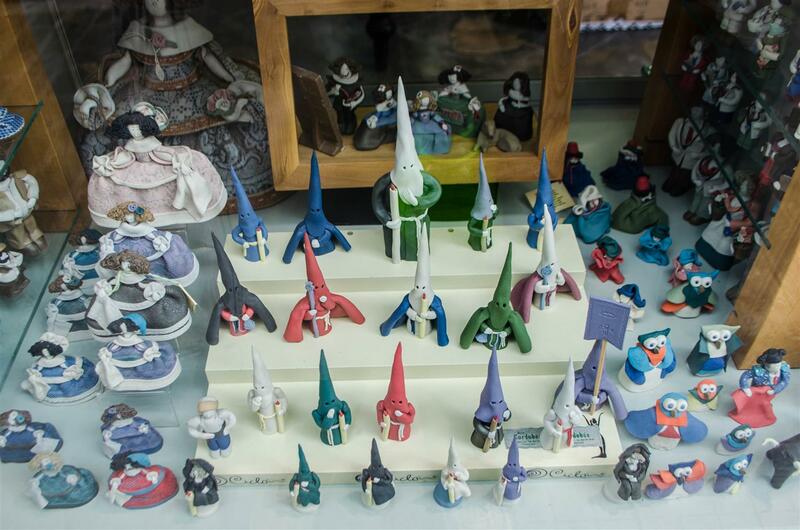 OK…please don’t blame us for our ignorance, but wouldn’t one very easily associate the costumes worn by these figurines with those of the KKK? Of course we had to figure out the significance of this seemingly strange occurrence. As it turns out, every year around Easter (which was when we went), during what’s called the Holy Week festival, processions take place whereby people are dressed up in these hoods to commemorate the passion of Christ. It’s been a tradition around Spain, especially in the Andalusia regions, of which Córdoba is a part. It has nothing to do with the KKK, none at all. So, there’s our mystery solved. At least we learned something new, right? For lunch, we sat down at a small restaurant serving local food. 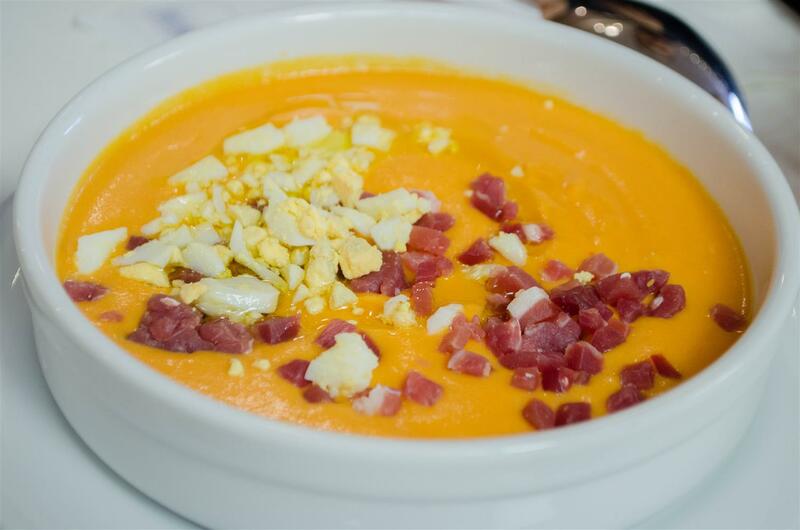 One of the things that we ordered was “salmorejo cordobés”, a specialty that originated from Córdoba. Even though we already had it a previous evening in Madrid, it was so good that we wanted to get it again. Salmorejo was a blended purée made of tomato, bread, and garlic…probably lots and lots of garlic. It is then garnished with diced cured Spanish ham and chunks of a hard-boiled egg. Since the taste and smell of garlic was so strong and rich, I liked to have it with lots of bread (even though it was probably meant to be just a cold soup), which was a delicious combination! 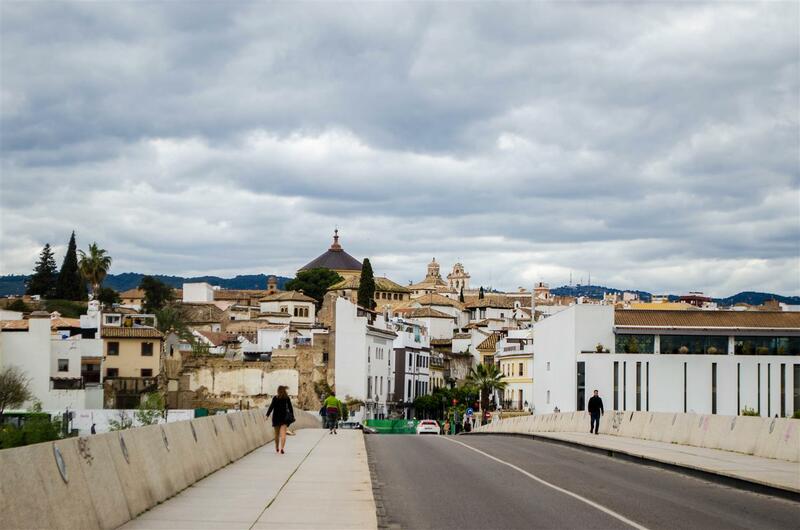 Crossing the Roman bridge, we arrived on the southern bank of Córdoba where we were able to look back and see the Mezquita from a distance. Then it became obvious that Córdoba was very…orange, or yellow. 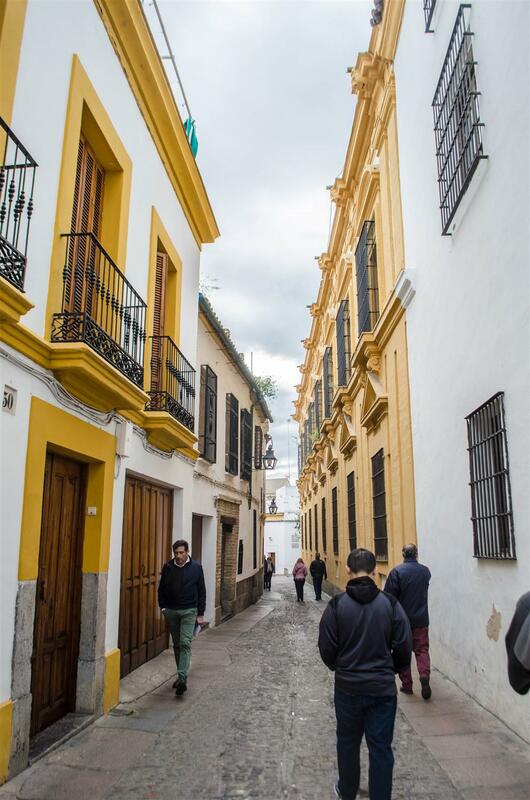 The houses lining the quaint streets, the columns in the Mezquita, the orange trees…even the salmerejo was orange! When I travel to one place for a sufficiently long period of time (typically more than 3 days), I like to look for small cities or towns nearby my main destination and make that a day trip. During a week-long trip to Barcelona, my friend LS and I took a half-day trip to the nearby Girona. A 4-day getaway in northwestern France brought me to Pornic, an unexpected little corner of the country where I spent two hours. Of course, when I went searching for Mr.DS in Lisbon in April, I visited the medieval town of Óbidos for a day. 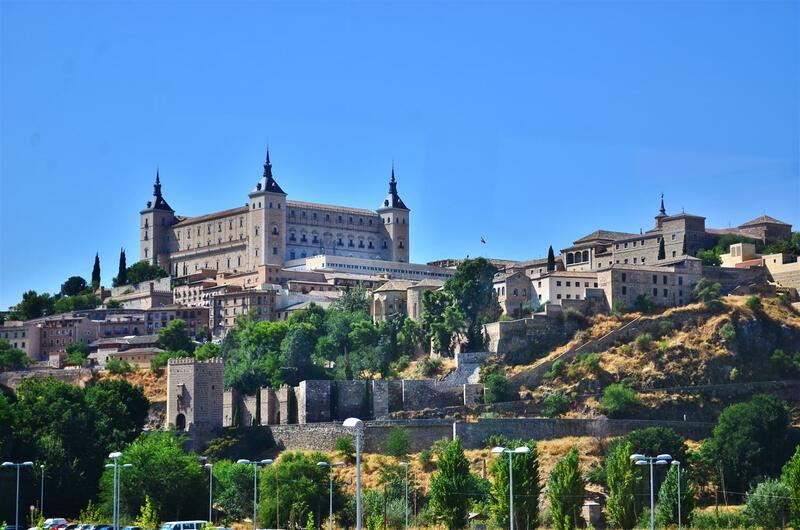 For Madrid, the detour was made in Toledo, a little medieval town 70 km to the south of Madrid. I had decided that I would definitely go for a visit, whether anyone came with me or not, after my oral presentation at the conference. After all, I finished it on the first day, and had nothing to worry about, woot! So to Toledo I went, ultimately with some of my conference buddies and we unfortunately missed the train that we were originally going to take because it ran out of seats as we were making reservations. Boo 😦 So then we waited two hours for the next one. The trip was quite short, taking only 33 minutes from central Madrid. We arrived and took a shuttle bus that took us from the train station to the city centre, which is situated on top of a gigantic hill. I would have loved to take the walk, but with a baby and a stroller in our party, the bus was a much more practical alternative on a hot day. Last week I was at the annual European Society for Biomaterials conference which took place in Madrid, Spain. This would be my last conference before the PhD defense, or shall I say, conference/vacation. Since the thesis rush began in May, I haven’t been travelling much during the summer. That was why I decided that I should make the best out of this conference and take some time to relax before the defense creeps in. And yes, I have finished writing my thesis, the preliminary draft, at least. Copies have been sent out to the jury and now I am just waiting for October 14, doomsday AKA the pre-defense in Belgium. 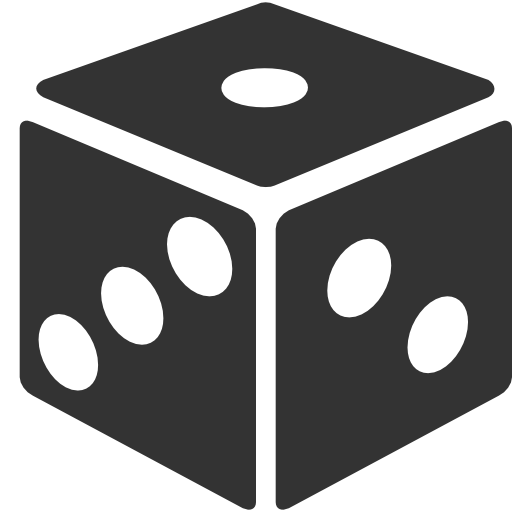 (I won’t go into detail about the pre-defense and public defense, but just know that the pre-defense is much much much harder than the public defense.) I really should start preparing, but after sending out the thesis, I was hit with a feeling of “now what?” It almost feels like I’m denying the fact that the defense is coming up so soon, sort of like how I was in denial of ever having to write a thesis. Let’s hope this denial phase disappears soon. Anyway, about the conference, this was my third time in Spain in three years. As it turns out, it was not only an academic experience, but I met new friends and more than anything, this was an unexpected trip of gastronomic indulgence, as you will soon see. We started our sightseeing around Puerta del Sol, an area in the Madrid city centre. 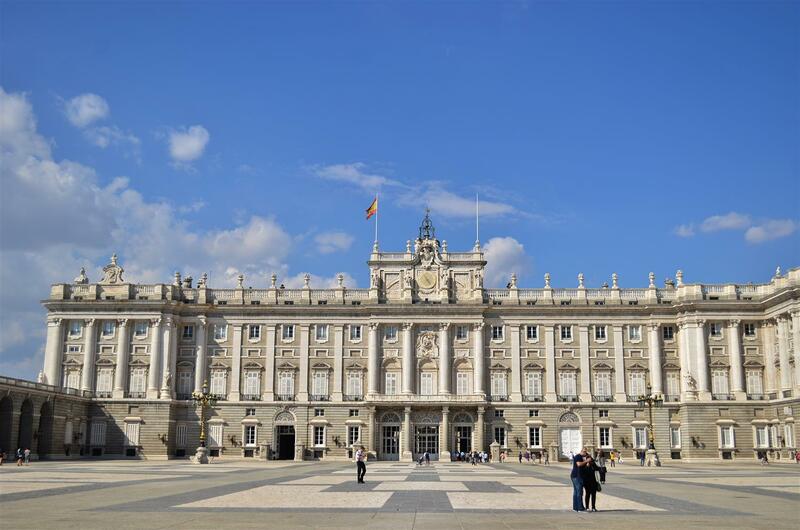 Nearby Sol was the gigantic Royal Palace of Madrid, one of the city’s most recognized landmarks.